British Airways Executive Club is a great program that can really stretch the value of your Ultimate Rewards points. Since BA is an airline partner of UR you can transfer points to Execuive Club, the airline’s frequent flyer program. While British Airways is not a U.S. airline, you can use Avios to fly on its partner airlines, which include American or Alaska. Also, unlike most U.S. based airline programs, British Airways Executive Club is a distance-based program, and it works best on relatively short, non-stop flights. Redemption levels start at 7,500 Avios per one-way flight (15,000 roundtip) in the U.S. and 4,000 Avios (8,000 roundtip) elsewhere. Short flights in the U.S. Nonstop flights for distances up to 1,150 miles in the U.S. are priced at 7,500 Avios one way, which is a much better rate than reduced United flights priced at 10,000 miles for distanced up to 700 miles. The next level is 10,000 Avios for distances between 1,151 and 2,000 miles. You hold a Sapphire Reserve card and your roundtrip ticket costs $225 or more on the Ultimate Rewards site. For better understanding of this valuation, read the Best and Worst Examples of Using Chase Ultimate Rewards Points – The Portal. A few examples of flights under 1,150 miles are: NYC – Miami, Toronto/Montreal, Washington, Chicago or Bermuda or Los Angeles to Seattle on the West Coast. 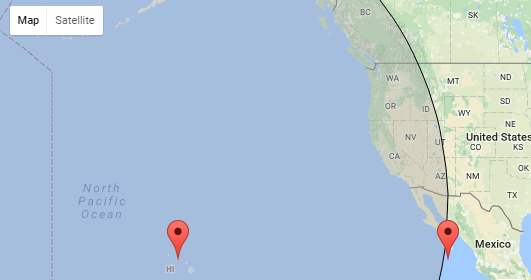 You can find the distance between cities with this free tool. Flights between the continental U.S. and Hawaii cost 22,500 one way, but the West Coast lies well within a 3,000-mile distance from Honolulu, so if you transfer your Ultimate Rewards points to BAEC, you can fly between the West Coast and Honolulu on American or Alaska for 12,500 Avios or 25,000 per roundtrip. One of the most amazing Ultimate Rewards values is redeeming Avios between Boston and Dublin on a British partner Aer Lingus for 25,000 per roundtrip. Even a business class ticket (redeeming Avios for business class tickets are not usually recommended) for 75,000 Avios per roundtrip is a good deal compared to United’s 100,000 miles price tag. Transfer your Ultimate Rewards points to BAEC and fly from New York to Berlin/Dusseldorf for 40,000 Avios on Air Berlin (per roundtrip), or to Madrid for 34,000 Avios on Iberia. United charges 60,000 miles for flights between the U.S. and Europe. We generally discourage people from using Avios to fly British Airways over the ocean due to high fuel surcharges, but short- and medium-haul flights between London and Continental Europe can be a real bargain. The fees on intra-Europe BA flights are capped at £35 (which is slightly above $45 with current exchange rates), so you can connect anywhere in Europe for cheap. You can fly to Marseilles or Copenhagen for 9,000 Avios per roundtrip, Rome, Ibiza and Budapest for 15,000 Avios, or Moscow, Athens and Istanbul for 20,000. Intra-South American flights can be prohibitively expensive; a one-hour flight between Lima and Cuzco (a gateway to Machu Picchu) can cost hundreds of dollars. However, the same flight can be yours for 4,500 Avios one way. Same 4,500 Avios can get you between other popular cities, for example, Sao Paulo and Iguassu Falls or Rio and Florianopolis. 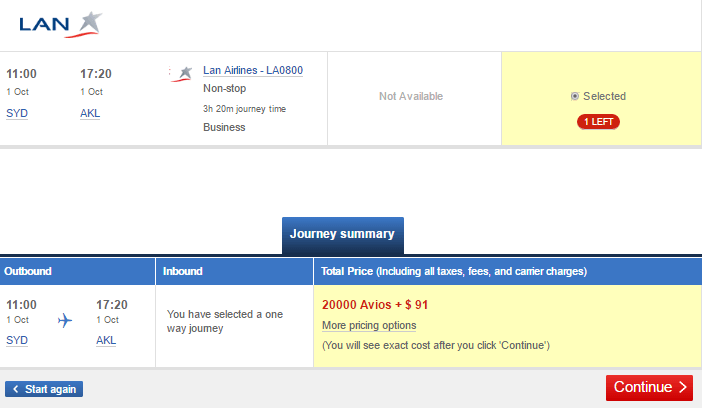 Or you can fly from Buenos Aires to Santiago de Chile for 7,500 one way. Qantas holds a virtual monopoly on intra-Australia flights, so it shouldn’t come as a surprise that a 1.5- hour flight between Sydney and Melbourne can cost $300-400 sometimes. Instead, transfer you Ultimate Rewards points to BAEC and book the same flight for 4,500 Avios and a few dollars of taxes. This is a rare instance when we can recommend paying slightly more for a business class flight. This route is served by South American LAN on the way to/from Santiago and features Premium Business class with lie-flat seats. This 3.5 hour flight will cost you 20,000 Avios in business or 10,000 Avios in economy (one way). You can fly from Hong Kong to Hanoi or Taipei for 4,500 Avios and to Chiang Mai or Siem Reap for 7,500 Avios one way. You can also use other oneworld partners Malaysia and SriLankan, but both add some fuel surcharges to their award tickets. Or you can redeem 4,500 Avios for any intra-Japan one-way flight on JAL from Tokyo – be it to Fukuoka in the South or Sapporo in the North. This list is amazingly short. The way Executive Club is designed is that any extra segment adds costs. So if there isn’t a non-stop flight or if you can’t find a nonstop availability, the system will usually (although not always) charge you for two segments instead of one. For example, the flying distance between New York and Tampa, is just a hair above 1,000 miles which means it would cost 7,500 Avios per one-way flight if there was a non-stop flight between these two cities on American. Unfortunately, there isn’t, so when the computer routes your flight via Miami or Washington, DC, it adds an extra segment, meaning that you end up paying 15,000 Avios instead of 7,500. That makes transferring to United or booking your trip with Ultimate Rewards points a better option. Once again, this is not always the case, so try to price your itinerary on the British Airways website first. With some exceptions, using Avios to book first, or even business class is rarely a good deal. The BAEC scheme operates with a premise of a four-class configuration. So if an economy seat costs 4,500 Avios, then a premium economy seat is 6,750, which is 50 percent more; a business class seat is 9,000, which is twice as much as a seat in economy; and a first class seat is 18,000 Avios, which is twice as much as a seat in business. While redeeming Avios for a business class seat may be a decent value (like our Boston-Dublin and Auckland-Sydney examples), in general, the best value of the BAEC program is in short trip redemptions. There just isn’t much value in spending a lot of points for a two to three-hour flight. If you’re interested in business or first, save your Ultimate Rewards points for another day and transfer them into a program providing a much better value for long-haul premium class travel.